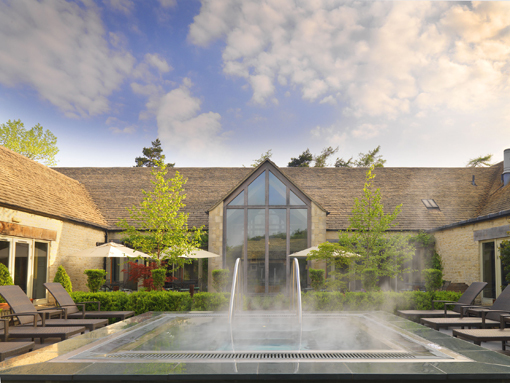 If you’re searching for style and substance from the ultimate English spa look no further than Calcot Manor. JANET BRICE literally comes away from this Cotswold gem smelling of roses after trying one of their signature treatments. 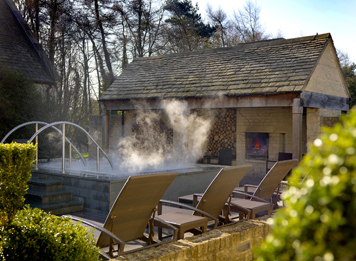 Basking in a bubbling, outdoor hot tub in the shadow of an open-fire sipping a glass of champagne – now that’s what I call a spa! 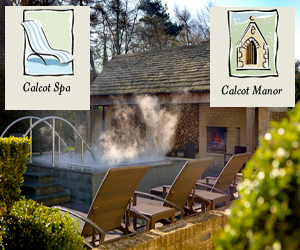 Calcot Manor epitomises the spa experience with its quintessentially English setting in the Cotwolds and a classic treatment menu. But a word of warning if you’re a day visitor – try to arrive at least an hour before your massage or facial as this will give you the chance to take a dip in the tub, which is heated to 40 degrees, or take a swim in the stylish 16-metre sea-blue swimming pool. The reason I say this is because I would normally relax after my treatment with a swim or Jacuzzi. But my 80-minute Luxury Rose Indulgence Treatment had literally left me “smelling of roses” and, however tempting that hot tub was, I knew the oils had to be absorbed and I wasn’t willing to risk losing my newly-buffed moisturied skin for anything. Tempting though it was to hot-foot it to the tub, which bubbles away like a geyser, my decision was easy as I had just enjoyed one of the best body treatments I had ever experienced and I wanted to savour the moment. The subtle scent of Damask Rose radiated from my smooth skin as I lounged in Calcot’s chill-out room and as I sipped a glass of lemon water I could almost hear the silence of the countryside once enjoyed my the Cistercian monks who built the manor in the 14th century. My therapist, Sarah, had worked her magic on my skin with the damask rose range of products from Aromatherapist Associates which included the Renew Bath and Body products for my skin and Restore and Rejuvenate Essential Skincare for my facial. Sarah started my treatment with a body brush and exfoliated before applying a wonderfully warmed rose gel and body cream and then wrapped me like a mummy to allow the products to soak in. The treatment room was dimly lit for modesty and total relaxation with just a hint of light from a pyramid-shaped window which added to the ambience along with the soothing music. As I languished in my rose bed, Sarah started my facial which continued the floral theme with a rose cleanser and skin tonic. But the highlight was when she literally painted on the cooling rose hydrating mask. And, unlike other therapists who then leave you alone in the room (and probably pop off for a coffee) while the mask sets, Sarah used this time productively to give me a hand and arm massage – making you feel that when Calcot Spa says it’s a 80-minute massage they really mean it. At the end of my treatment my skin felt like silk and my body rejuvenated which is why I slipped away to the café for a healthy crab and avocado sandwich instead of that tempting glass of bubbly in the bubbly! • It’s big and airy, comforting and cosy which is why you must book in advance as it’s very popular with the locals. The damask rose is a cultivated flower, no longer found growing wild, and originally came from Persia or the Middle East. The Crusader Robert de Brie is sometimes given credit for bringing the Damask rose from Persia to Europe sometime in the 13th century. The name refers to Damascus, Syria a major city in the region. Other stories say the Romans brought the rose to England, and a third account says that the physician of Henry VIII gave him a Damask rose, as a present, around 1540. There is a history of fragrance production in Afghanistan from the Damask rose. An attempt has been made to restore this industry as an alternative for farmers who currently produce opium. Rosa damascena is best cultivated in hedge rows to help protect the blooms from wind. Gathering the flowers is quite labor intensive as it must be done by hand. There are about 20 to 40 days per year when harvesting occurs, depending on the type of Rosa damascena cultivated in the region. The largest producers of rose oil from the different names all falling under the name Rosa damascena are Bulgaria and Turkey. France and India also contribute significantly to the world market. Turkish rose oil is sold as “Rose Oil”, “Turkish Rose Otto” and "Rosa Damascena Attar”, or “Ittar’ in similar languages. While there are still families who run their own small distilleries and produce what is known as “village oil”, the commercialisation of Rose Oil as a high quality product is carefully regulated through a state-run co-operative in the Isparta region of Turkey. The roses are still grown by the small family farms but the flowers are brought to one of many stills set up and regulated by the co-operative for distillation and quality control. India has also developed an industry producing Rose Oil (both Rose Attar and Rose Absolutes) as well as Rose Concrete. Perhaps due to the low labour cost and the commitment of the Indian Government to international trade and high quality standards, these products from India today are cheaper than those from Bulgaria and Turkey. The city of Taif in Saudi Arabia is famous for the cultivation of this flower, which is called "Ward Taifi".